After battling mini math sections and losing to most of them, I need to rethink how I study. Though I have been studying for a couple of months and my exam date is a little more than eight weeks away, I have been making little progress in the quantative section. As some one who managed to evade math my senior year of high school and all throughout college, I have to re-teach myself most of the material on the GRE. I started to feel overwhelemed by this task and had no clue where to start. My plan has been to complete a practice math section and review the answers I got wrong (which, as I’ve mentioned previously, have been most of them). An obstacle I’m encountering is that because the math section contains problems from various categories (algebra, geometry), I find myself quickly swinging from category to category and not sticking to a category and the in and outs to that category to actually retain any of the information. I’m going over each incorrect answer and reviewing the correct answer just to learn it in the moment and not make any real effort to actually know and understand it and problems like it. I have come to realize that I need to spend more time on focusing on one category at a time, slowly transitioning into a new category, and intergrating the previously reviewed categories, if I want to do well on the GRE. When my 21 year old neice was in high school and started actively using Facebook, I constantly sent her private messages discouraging the use of shorthand text. I worried that it took away from her ability to effectively write and communicate. It’s okay to take your time and express your thoughts. Not everything has to have hashtags, abbreviations and fragmented responses. But we live in a society where shorthand and social media go hand-in-hand. 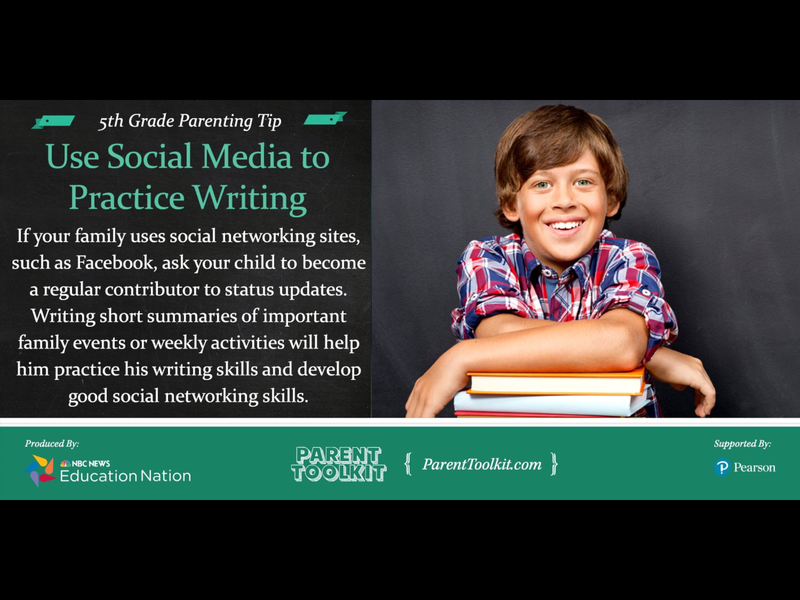 This NBC News’ Education Nation tip is timely, educational and require’s a challenge that can involve family members and friends (though I wasn’t aware that fifth graders used social media–boy am I getting old!). I think charter cheerleading keeps us from having a real conversation about the structural problems related to race and economic inequality in America. Woah, JerseyJazzman. This and other amazing gems in his scathing post about Chris Christie‘s plan to defund already underfunded public schools and the inaccurate Christie supporter who spews inaccurate data about schools to make charters look like they simply outshine public schools fair and square. Excellent post by Jan Resseger. We need to do better with our publoc schools. According to the American Federation of Teachers, the largest national teachers’ union in the U.S., Morris Jeff Community School, a charter school in New Orleans, signed it’s first three year union contract. What’s so amazing about this contract is that it is a collaborative effort that works to improve the lives of both students and teachers. With a student support committee, this agreement isn’t just about what teachers want, but focuses on students and their needs as well. Most charter schools, especially no-excuse charters, don’t have unions. But I think a central part of the teaching profession is the need for some sort of protection, because there are so many factors that are not in their control. Unlike a corporate position, where one is asked to, say, create innitiatives and execute them through tasks (that can be quanitified and the employess direct work product can be reviewed), the teaching orofession requires a professional to impart knowledge and engagement on many other individuals at any given time. Those students that come in and out of a teacher’s classrooom have their own reason and processes, whether on concious or subconscious, that can’t be quantified but that causes them to do well or not do well in school. This contract should be applauded and I’m excited to see what gains come of it in three years. ​Chris Christie, governor of New Jersey and Donald Trump supporter (and possible his VP nominee), proposed an education funding plan that would divert funds from underfunded inner-city public schools to well off public schools. The plan advocates for equal state funding or a flat rate funding to all students, regardless of the amount of funding the student already receives from local property and income taxes. Under his proposal, each New Jersey student would recieve a flat rate $6,599 from the state; this excludes special education students, who would receive more funds. Poor school districts, where parents can only afford to rent property and not own property, will see much needed “extra” state funding removed from their school budgets and sent to districts where spending per student already far exceeds the per student spending in poor districts. I placed the word extra in quotations because even with those state funds, the inner-city schools still can’t provide students with a decent quality education. Students in these poor districts will see a decrease in the quality of education because districts and schools will be forced to fire teachers, aides and cut back on after school programs, extracurricular activities and classroom resources. Meanwhile parents in the well off school districts will see a decrease in property taxes (meaning they bring home more money to their families) and an increase in the amount spent per student. A Rutgers University preliminary analysis featured in the New Jersey Education Policy Forum lays out how the already well off schools and families will benefit from this proposal and how the poorest schools will evidently be the losers (This report also disproves Christie’s claim that the 31 poorest schools have not in proved under the current funding plan). This is an attack on the beauracratic public school system. I understand that public schools are entrenched with wasteful policy spending, however, it makes no sense to decrease funding for these students. The obvious reason is that a decrease in funding will only increase their chances of staying in poverty. The cycle continues. But that’s not governor Christie’s problem or concern. How the hell is this proposal fair when it ensures that students in these low-income schools will make due with inadequate resources? It makes no sense. Summer Learning: Why Aren’t we Outraged About the Summer Slide? Effective employees across the world will be using similar skills, inadditon to a few others. Many young students, however, will have a two month long summer break where they won’t engage in various educational and social activites that will excercise their brains. We know that students, especially low-income students (particularly those living in suburban or rural areas), forget what they learned the previous year. …how can a system that claims to educate kids claim that students are learning when we don’t try to create an environment in which learning is continuous? I don’t mean that summer should be an extension of the school year, where you have children sitting in a classroom most of the day. The summer season is a great time for both teachers and students to enjoy the outdoors. Students should be taking class trips to museums and reading books outside. They should be engaging in discussions on current events, where they first read about an event and discuss their opinion– whatever that may be– with a group of peers at a picnic. Sadly, we’ve conditioned our students and families to believe that education is to be paused, for the most part, during the summer vacation. For a lot of low-income families, this is more of a default, mostly because lack of funds and vision of how to incorporate educational aspects in everyday life. Should the parents, financially disadvantage as they may be, find a way to provide their own children with a vibrant and varied experince that will keep their young minds active and academically and socially up to speed? Or, should some other third party, such as a children or educational non-profit organization or youth center take on this challenge? It’s expensive to keep a school open during the school year. It’s even more so during the summer months, because the cost to maintain a minimum level of saftey for a small number of students is far too high. Youth centers, and especially parents, are available year-long (presumably). One would think that this would route would make more sense. While I think it does, non-profit organizaions and low-income parents have the same issues schools have: lack of money. So who should step in and prevent the summer slide? I think the best answer would be a combinantion of all three sources, with parents leading the pact. So, of course, the next big question is how does this get funded? We know that this is an issue that doesn’t just impact student’s in a particular city of state. We know that millions of students in communities across the country come back to school less knowledgable and focused than before they left school for the summer break. But as a country, we choose to ignore this problem. We continue to unfairly evaluate teachers based on students’ test scores, which attempts to gage how much a student has learned from content that ws covered rgar school year. We don’t take into consideration the time teachers spend at the begining of the year trying to catch students up to speed. Even more troubling is that the summer slide points to something that is even more troubling. It shows that students can pass test at the end of the year but not make any real use for them, so as along as students can continue passing a few exams, they cen get away with not retaining realinformation. The system as a whole seems to be ineffective and we need government support behind a real solution, if we want our students to truly learn. I’m always troubled by the proverb “It takes a s village to raise a child.” Everyone seems to agree with this, but we won’t admit that we’re doing teachers and students a cruel injustice when we leave them alone for the summer with to real guidance as to how they can become multifacted learners, outside of the classroom environment.